Online interviews are on the rise. OfficeTeam surveyed more than 500 hiring managers at companies with more than 20 employees. 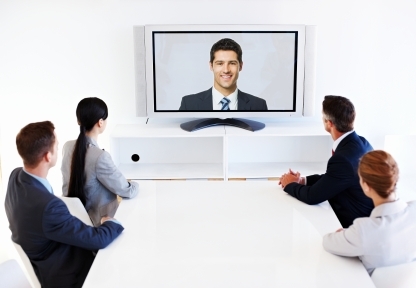 They found that 63 percent often use videoconferencing for job interviews. There are two kinds of online interviews. Two-way interviews take place in real time over Skype or others such services. In a one-way interviews, you talk into the camera and answer preset questions without a live interviewer. The employer provides you with a link where you are guided through a series of screens, with about three minutes to answer each question. Sometimes you have the option to play back your answers and redo them if you are not satisfied. While younger people tend to be more comfortable with video and do better in on-line interviews, sometimes they are too comfortable with the medium and come across as un-serious. Overall, though, applicants interviewed by video are not as likely to get hired as those who are interviewed in person. • Get a good quality camera and microphone. • Use a small tripod to position your camera in the middle of the monitor so you are looking straight at your interviewer. • Clean your camera lens. • Double check the audio level. • Place yourself in front of a neutral, uncluttered background with good natural lighting that minimizes shadows. • Set up in a quiet place where you will not be interrupted. • Place a clock behind your monitor so you can cover your main points within the allotted time. • “Dress for success” as if this were a live interview. Avoid loud patterns or colors. • Yes, pin notes up where you can see them behind the monitor. But do not read your answers; the interviewer can tell and it will count against you. • Frame your face, showing only your head, shoulders and upper chest. • Sit still. No fidgeting! • To make eye contact, look into the camera, not the face on the screen. • A furrowed brow is read as confusion, disagreement and discomfort. • Lack of eye contact is interpreted as discomfort and dishonesty. • Frowning suggests disinterest and tension. • Leaning back shows resistance, disinterest and doubt. • Have a friend or your PSGCNJ job-search buddy interview you via video so you can review how you look and sound. • Check that your lighting and angles are flattering. For example, overhead lighting accentuates wrinkles and double chins. • Women should experiment with their make-up to be sure that it conveys a natural look. • Time yourself and make sure you cover all your main points without speaking for too long. • Listen for the quality of your voice. If it’s grating, tone it down a notch.